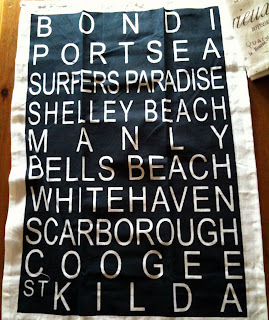 As mentioned in my last post, I found some gorgeous bus scroll tea towels. Back I went to the store and purchased some more to offer to my lovely blogger friends. 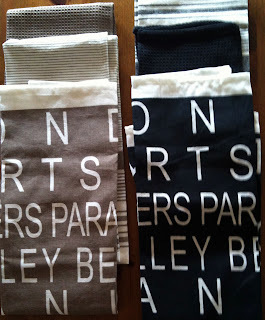 I am giving away two prizes.....share the joy......... on offer are a set of tea towels for two lucky bloggers. 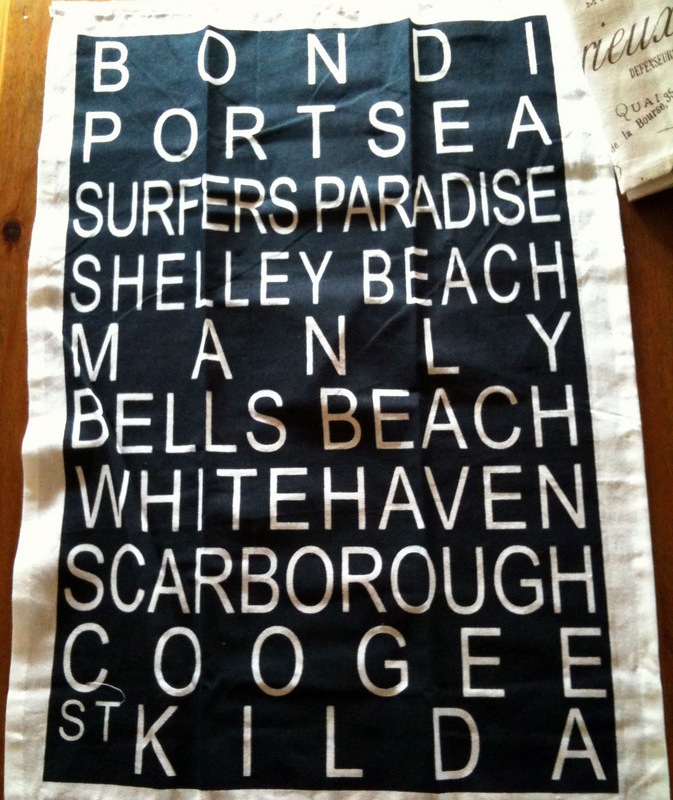 Each is a set of three tea towels containing one plain, one strippy and one bus scroll with Aussie beaches. You can chose from either the black set or the tan coloured set. Ooooops this pic was of mine straight from the packet..but you get the idea of the colour! So if you would like to enter..
1. Leave me a comment letting me know you are a follower or become one if you haven't already. I will have a draw for each set. 2. If you add it to your side bar ... that will be another entry so leave a comment letting me know. I will draw the winners next Sunday 24th AEST. HAPPY blogiversary....!! WOW....SIX months already....Where DID the time go....hahahahahaha....! I'm LOVIN' your new blog header by the way....Very VERY YOU....! Take care & have a WONDERFUL week....! firstly....yehar...big congrats for 6 month...it is a lovely world this bloggy one isn't it!! my sister in law arrived from sydney this morning with my 2 nieces and i'm still hoping she smuggled me over a jar of sydney sand...i've made her tea and put her to bed she's soo jetagged....a bit of english countryside for them all this afternoon and a rummage through her bags for that sand!! Congratulations on 6 months of blogging, I love love love your work. It would be fabulous to be entered in your lovely give away! Congrats on 6 months of blogging - doesn't time fly? Well done Kyandra on 6 months of blogging and on purchasing such a lovely giveaway.Please add me to the list of happy followers hoping to win the black set. Lovely giveaway. Please count me in for the black set. Thanks! follower of the blog! and I love the black and white ones! :) happy blogoversary! Congratulations Kym! So nice to see you are loving this blogging thing. Congratulations on your anniversary Kim! Of coarse I am already a follower and would love to win the gorgeous black set! Happy 6th month blogiversary and thanks for the great give away. I just found your blog via Fun and VJ's and am one of your newest followers. Hi Kym, Congratulations on a six month blogiversary. I am a follower and am happy to participate in this thoughtful giveaway. I like the tan set. Me again, I have posted this giveaway in my sidebar too. Congratulations on your 6 month blog anniversary! I don't have a blog yet but I am a new follower to your blog. I love the tan set of towels. Congrats on 6 months of blogging. Have been a follower for a while now. 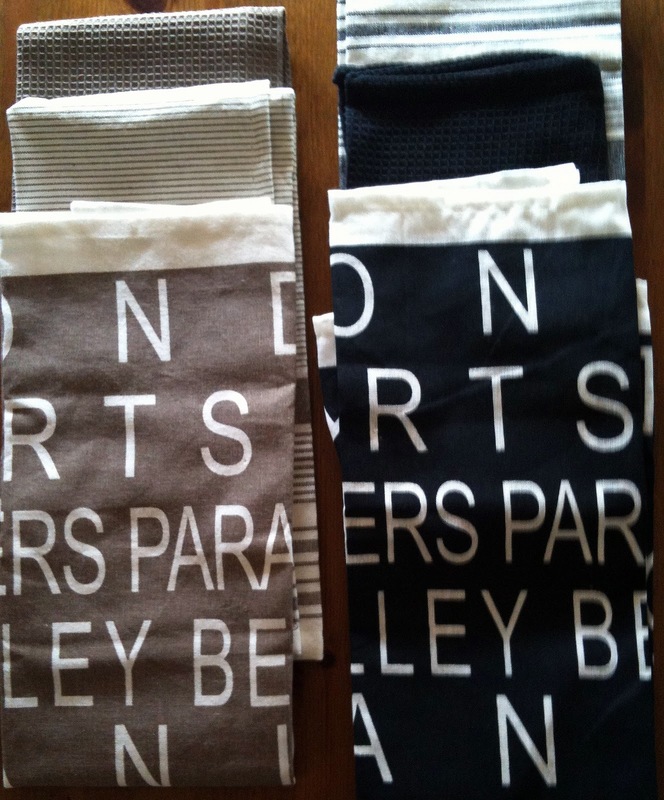 Thank you for the chance to win these gorgeous tea towels. I love the tan set and would make cushions out of them if I win. 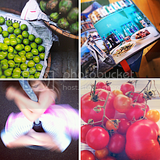 Hi Kym, I am a newcomer to your blog, and I found beautiful. Take this opportunity to sign up for your giveaway, the truth is that both colors I like, but I declined for white and black. Hopefully get lucky, as would be the first time I've won some contest. I just added your giveaway to my sidebar Kyandra. Congratulations on 6 months of beautiful blogging! I just realized I am coming up on my 6 month anniversary too. I guess it's about time for me to do a giveaway!